The panel discussion and print exhibition will focus on immigration, discrimination and citizenship. The Maxwell School of Citizenship and Public Affairs and the College of Visual and Performing Arts (VPA) have invited the public and members of the media to join them for an exhibition and panel discussion on issues surrounding discrimination, immigration and citizenship as seen through the lens of artistic expression and activism. The panel discussion will take place on Thursday, Sept. 18, beginning at 5:45 p.m. in 204 Maxwell Hall. The event, sponsored by Maxwell’s Program for the Advancement of Research on Conflict and Collaboration (PARCC) and VPA and titled “Carving Through Borders: Discrimination, Immigration and Citizenship,” will feature an exhibition of large-scale prints created as part of VPA’s long-running Steamroller Project. The prints will be displayed in the Joseph A. Strasser Commons in Eggers Hall during a reception beginning at 5 p.m. Music will be provided by Samba Laranja, the Syracuse University Brazilian Ensemble. 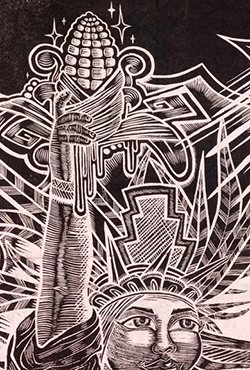 The evening’s discussion will bring together Syracuse University faculty and Santiago Armengod, a Mexico City-based printmaker who attempts to communicate the urgency of radical change through his artwork. The discussion will focus on the tensions in American society and policy in relation to immigration and citizenship, with a particular spotlight on the artistic expression of the discrimination experienced by many Latin Americans. Syracuse University panelists will include Kristi Andersen, Chapple Family Professor of Citizenship and Democracy at the Maxwell School, and Andrew Saluti, assistant director of SUArt Galleries. Catherine Gerard, director of PARCC, will moderate. The artwork was a collaborative effort among VPA printmaking faculty and students, along with San Francisco artist and activist Favianna Rodriguez. It was completed in March 2014 during a public event in San Francisco, where artists created seven-foot-long woodcarvings that were inked and transferred onto muslin cloth by a team of Syracuse University students using a two-ton steamroller. The end product was large-scale cloth prints that not only serve as artwork, but can be used as tools for expression during rallies and marches.